Play Gold Slot Online with 500 Free Spins! Gold is 5 reels, 20 paylines Online Slot Game by Big Time Gaming. Gold has up to 180 Free Spins, Scatter symbols, and Gold Case Wild features and an RTP of 95.03%. Gold online slots game depicts class and affluence so you can almost tell what the casino is all about before you launch it. When you do, the first thing you notice is the generous use of the golden colour; you will see cars in gold, rings, suitcases and even bank cards made from gold. The good news is that this game promises its players a chance to lay their hands on this precious commodity. By playing the Gold mobile slots, you too can lay your hands on this fortune. Big Time Gaming is a world-class video slot developer which has been dominating the industry for years. It produces slot games in more than 20 languages such as Chinese, English, Japanese and Russian. Their overwhelming slots include Bonanza slot game and Temple Quest Spinfinity online slot, which you can find on Rose Slots and enjoy. 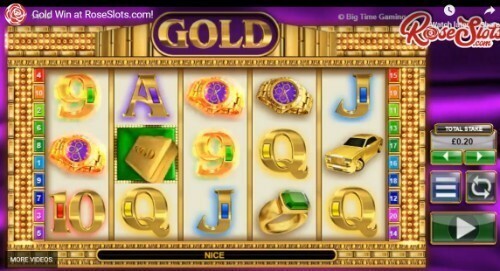 Looking for a shortcut to riches in the Gold slot online game? Mark the appearance of the wild because it is going to be your companion throughout the play. If you see it appear on the reels, any wins made on that round are going to be multiplied by 2 and this is a great way will keep your bankroll steady. Another way that a player benefits from the wild are if 5 of them appear on the reels at the same time, and the result of this can only be believed if seen. With this Microgaming slot, players stand a chance to win up to 180 free spins during play. The number of free spins awarded will vary according to the frequency of triggers and there is a chance that the free spins feature will be retriggered on a bonus round. This video slots may cause ripples to run through one’s pockets but the concept on which it was created is not particularly new to players of video slots. You might, however, find that shouting ‘GOLD!’ when playing this slot causes a special thrill that is not common with other slots and that too many people may motivate them to stay on and earn more. Comprised of 5 reels and 20 pay lines, and a generous up to 180 free spins, a win in this slot is an epic occurrence. There is an equal chance of winning and losing but what keeps players glued to their devices is the entertainment they get. Regardless of any device, you have where you are, it is pleasant news to know that you can enjoy this game since it is optimized for all mobile phones, laptops, and tablets. if you wish to win hard, be prepared to play hard but it is just a game to spice your thrills.